ITACOLUMITE: the rock that bends. It will bend and when turned over will bend in the opposite direction. 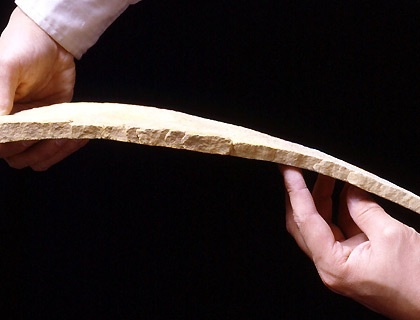 No known practical use has been found for this bend rock, but it is a source of gold and some diamonds in Brazil and India. It is also found near clay with diamonds in it in these countries. Itacolumite is a metamorphic rock. The rock is a most extraordinary kind of sandstone and will bend under its own weight and slabs of it will bend even if the slabs are thick. The rock’s flexibility is caused by symmetrical quartz grains which interlock and, therefore, rotate against each other when it bends. There is also some mica in it that helps as elasticity for the bending. Minerals of chlorite and talc are also found flexible. Itacolumite is porous to some degree from the water running through the veins in the rock. BENTONITE: the rock that swells. This rock, when put in water, will swell, taking up some five times its own weight, and can enlarge to 50 times its own volume. Bentonite is a clay mineral, which makes it soft and slippery. The Black Hills region has beds of this mineral and they have a very wrinkled look when viewing them, as there is hardly any vegetation growing on them. Bentonite is mined with mechanical shovels used for industrial purposes. Bentonite is used by oilmen in filling the pores in rocks in which they are drilling for oil. It filters and also purifies some commercial products and holds molding sand together. It is also used as a paper filler/carrier for use in such things as drugs and in farm ponds to prevent leakage. There are many other uses as well. Utah is one of the sources of bentonite. MAGNETITE: The mineral, magnetite, used in compass needles has been found in Monarch butterflies. This discovery ma help explain the well-known yearly migration of this species from eastern North America to Mexico.